I always smile when I’m flying somewhere and I see the flight attendant begin his/her safety presentation. Inevitably, they get to the part where they put on the oxygen masks and remind us that if we’re traveling with small children to put our own masks on first. And while thankfully I don’t look to put an oxygen mask on in my every day life, I always smile at the amazing metaphor the in-flight oxygen mask is for our lives. Because if you’re not putting your own mask on first, how are you going to be at your best to support others? How will you be able to create abundance in your life? As July came to a close and August began this year, quite honestly I was highly emotional and wanted to rest and be quiet. It had been a long 18 months of traveling and personal growth and my soul was crying out for a break. I had reached “that point” that most of us know about…the one where your mind is foggy and you don’t know what direction you’re headed in and you want to take naps all day. Generally speaking, I do a good job of taking care of myself and it snuck up on me and I ended up exhausted without much of a warning. This time it was exhausted in a different way though – years ago I would experience physical and mental exhaustion after working countless 70-80 hour weeks, and this time it was more emotional exhaustion. 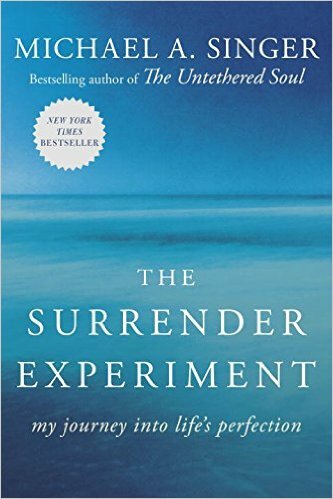 I felt directionless and uncertain…so many things felt like they were changing. I was also concerned about how long this phase was going to last since I really don’t enjoy drifting along without energy or a sense of drive. The emotional exhaustion was impacting my body, my confidence, and my desire to spend time with others (I was so tired and my introvert just wanted to hide and chill out!). All of a sudden it clicked. This time had been created for me to reconnect with my intuition. 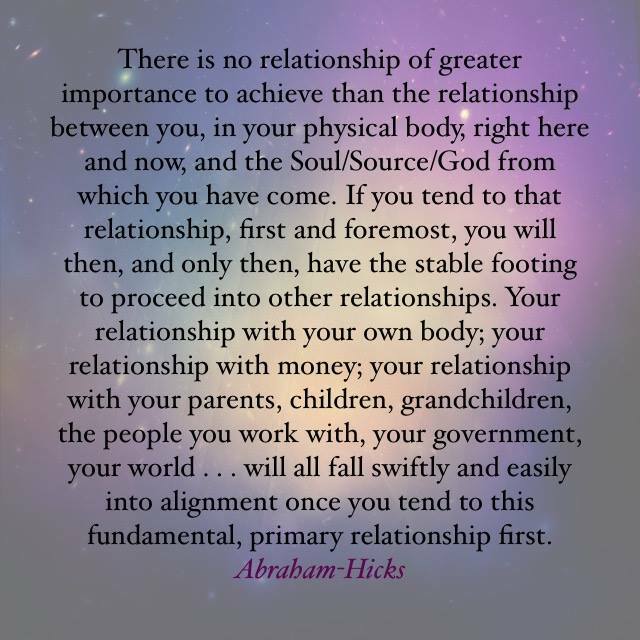 As the quote shares, when I connect with that relationship first and foremost, only then can I powerfully step into other relationships including my relationship with money. For too long, I had ignored the whispers to take my self care to the next level (i.e. healthier eating, increased meditation, etc. ), and instead had insisted on pushing forward. Even if I didn’t want to admit it, it was indeed impacting all of my other relationships and my ability to be present. So, I’ll ask you this after hearing my story – can you hear the whispers in your own life to slow down and listen? Check in with yourself, and see what, if any, course corrections are necessary to fuel you to build a strong and healthy relationship with your money and to step into your best life. Because without fuel in your gas tank, getting from point “A” to point “B” and creating abundance in your life is going to be all that much harder. Sometimes life shows up with lessons that we don’t understand and perhaps that we don’t necessarily want to learn. I didn’t want to slow down and take a month-long rest, and yet somehow my soul knew it was exactly what I needed in order to be prepared for the next part of my journey. Are you present enough to see the signs taking place around you every day? Are you taking yourself for granted as the foundational pillar upon which the rest of your life will be created? Don’t wait until it’s too late…take some time today to stop, breathe, and listen. Traditionally, when most people hear the word “abundance” they immediately think about money. And while that would seem to be the most common understanding of the word, as I’m finding out more and more often in my own life it is a very small part of how we can truly experience abundance. Abundance can come in the amount of joy we have in our lives, in the amount of love we have for others, in the amount of beauty that we see in nature, and in the exciting and unexpected mysteries that pop up in our everyday lives and enchant us. And quite honestly, I could go on and on and on about how many other places we can see abundance! However, in speaking with my clients when we talk about abundance they understand it in concept (as in, how they could see it or experience it in their lives), yet they have trouble either generating it or seeing it once they’ve generated it. 1)	Chase inspiration – There’s something about the high energy and positive vibration of being in an activity that you love and could spend countless hours doing. It creates joy in your soul and often times allows you to offer the best of yourself to the world as you step out of over-thinking (which many of us do, myself included!) and into a place of flow and ease. From this place of flow, you’re best able to clearly understand what next step is best for you and you act as a lightning rod for new and exciting opportunities to show up. 3)	Be mindful – You may have heard the phrase “thoughts become things” and I am a firm believer that we create our own reality with our thoughts. So, for example, a few months ago I was experiencing thoughts of fear, and guess what showed up in my life – scarcity! When I was able to shift my thoughts to a more positive outlook (which took some heavy focus, let me tell you), what showed up was much more joyful and peaceful. 4)	Practice presence – This step is the key for me to be able to take the other steps I’ve mentioned so far. When I slow down enough to create quiet space, it allows me to gain clarity on what inspires me, where I get to surrender, and what thoughts I get to be mindful of and shift. There are many ways I create quiet space including meditation, reading, hanging out at the local park (where the landscape is gorgeous! ), journaling, and working out (it clears my head and has me focus on my body). For me, the practice of each of these steps has supported in shifting me away from a feeling of scarcity toward abundance and joy. And while some of that abundance has been showing up in my bank account, I can honestly say that the majority of it has been showing up in how I feel in my body, how clear my mind is, and how many creative ideas I’ve had and how much I’ve been able to enjoy the small moments that show up in my day. Each of these steps is simple in concept, yet not necessarily easy. It takes a dedicated focus, commitment, and practice to create the wide range of abundance that each of us has access to – we only need to take the time to tap into it! So you might be asking, what do all of these statements have in common? They’re money beliefs that many of my clients have that keep them from stepping into their power with money and using money as the amazing tool that it is to create the lives of their dreams. The fact is that the stories we create around money are often unconscious ones and so we aren’t even aware that they exist. Perhaps you grew up in a household where your father said “you’ll never be any good with money” after you made a few mistakes learning how to spend money. If you decide that he’s right in what he says and you tell yourself that story enough times (consciously or unconsciously), you begin to engrain the belief that you’re not good at managing money which then allows your past experiences and mistakes to invent your future. Essentially, when we live consistent with the belief that we’ve created, our lives are designed by default as we unconsciously behave and react in accordance with what we believe. Our brains invest energy and time to reinforce the belief by collecting evidence that the belief is correct! I’ll use myself as an example to illustrate the cycle of “living by default.” I grew up in a household where gratefully my parents taught me about money from an early age so that as an adult, I had basic money management systems and processes in place to support me in effectively using my money. This was helpful in having me build financial security so that I had freedom and choice in later years to leave behind a role that was no longer a good fit, to thrive after my position was eliminated, and to eventually start my own business. However, while all of that technical information on money management systems, processes, habits, and routines was definitely helpful, what I didn’t realize was that I had developed a money belief that “financial security comes from a paycheck and benefits.” And I only figured this out in summer 2010 as I embarked on a new professional life as a financial coach where I would be working in someone else’s business on almost 90% commission. Talk about a huge potential roadblock to working successfully as a consultant if I believed that I could only be financially secure by someone paying me a paycheck consistently! And as I looked back at the professional path I had taken in the 13 years before, I realized how this belief kept me in my corporate job much longer than I wanted because I wanted to be comfortable and safe with the salary I was earning. Once I was aware of this belief, it was my choice as to whether to create a new story for myself about my abilities to create my own paycheck based on my own worth and ability to contribute in a different way. I can’t say it was easy, yet once I recognized the roadblock of this belief I chose to interrupt the story I had created and break away from living in the pattern that I could only find success by working for someone else. After making the decision to shift my belief and change my story, I could then live consciously in the present and choose the “financial rules” and beliefs that would create my life. I chose to believe that with the right mentorship and support, that I could learn how to become a successful entrepreneur who created her own income and my own life. I began to take action that supported that belief by training myself to understand more about how to build a successful business. And along that journey of training and learning, I have opened myself up to an entirely new world of “living by design” where I consciously choose my beliefs and the actions that I take. Perhaps it’s not your dream to start your own business, however I can almost guarantee that unless you’ve spent a lot of time already identifying and shifting your money beliefs that there is something running around in the hamster wheel in your head that is holding you back from the abundant and thriving life that you truly want to create. I invite you to create money beliefs that support you in thriving in your life and consciously allow yourself to live life by design, and not by default. Being present to what you want to create in your life and relishing the freedom and joy that accompanies living consciously is an amazing way to live! Death has a way of having you get clear on just how grateful you are for the amazing things in your life. With the sad, yet expected, death of 2 grandparents last week (they had been ill in nursing homes for many years), it was a vivid reminder to value every minute you have because you never know when your time will be up. And when our time is up, will we have genuinely appreciated all of the abundance present in our lives? My experience is that very often we’re moving too quickly to “smell the roses,” as the old saying goes. And sometimes it can be as simple as sitting down to look at the everyday occurrences that give us joy or make us smile. For me, abundance lies in some of the amazing simplicities of life. I love the peace that I feel in the very early hours of the morning, and how I am blessed to work from my home office and have a short commute up my stairs to start my work day. I enjoy learning new things about my friends and family and what excites them or what they’re up to. I feel safe in the cozy, comfortable home that I’ve owned for 10 years and I enjoy the calmness of the space that I’ve created. The fact that my “work” doesn’t feel like work at all is one of the greatest blessings of my life – I get to support people in forever changing their lives forever by recreating their relationship with money. I get excited by reading a good book and learning something new. I love receiving clear signs that I’m on the right track with what I’m up to. I happily grocery shop each week for healthy food and have a reliable car to keep me on the move. I’m committed to continuing to grow and take myself to the next level. For my clients, abundance often is experienced in the small things at first after many years of running around in a tornado of financial stress. One client recently told me that she was thrilled this past Christmas when she and her husband set a limit on the people they were buying gifts for and also a spending limit of $50. She said she was more mindful of buying a meaningful gift with the $50 per person, and perhaps most remarkably she experienced a deeper sense of connection with her family as she focused more on the experience of the holiday than the gifts typically associated with it. Another client told me that her best Christmas gift was that her husband was now sleeping through the night knowing that his family was taken care of. And yet other clients have indicated that they’ve enjoyed traveling to exotic locations, connecting with family at a variety of events, and also accomplishing something that they’ve been wanting to do for a long time (i.e. finish school, pay off debt, etc.). What is it that has you smile from ear to ear? Where in your life do you experience joy and passion? What has you experience contentment, fulfillment, or gratitude? Abundance is often all around us, just waiting for us to be a witness to it. And often times all it takes is slowing down long enough to look around us and appreciate it. Where is abundance hiding in plain sight in your life and you don’t even know it? Consider starting a daily abundance journal that you fill with the things that you’re grateful for. Every morning, I take a few minutes to think about at least 5 things that I’m grateful for that represent abundance in my life. It’s one of the favorite parts of my day to set my mind in the right energy – so perhaps it can also support you to appreciate the abundance that is waiting to be seen in your world! If I’ve learned anything in my almost 40 years on this earth, it’s that when we clearly see the abundance in our lives and express gratitude for it, we attract more of it into our lives. And who doesn’t want more abundance in their lives, right? I wish you unlimited contentment, fulfillment, gratitude, abundance, joy, passion and anything else that makes you happy!